At Business Interiors we have seen a few office reception’s in our time, so when we say this is THE best office lobby we have ever seen, it is high praise indeed. 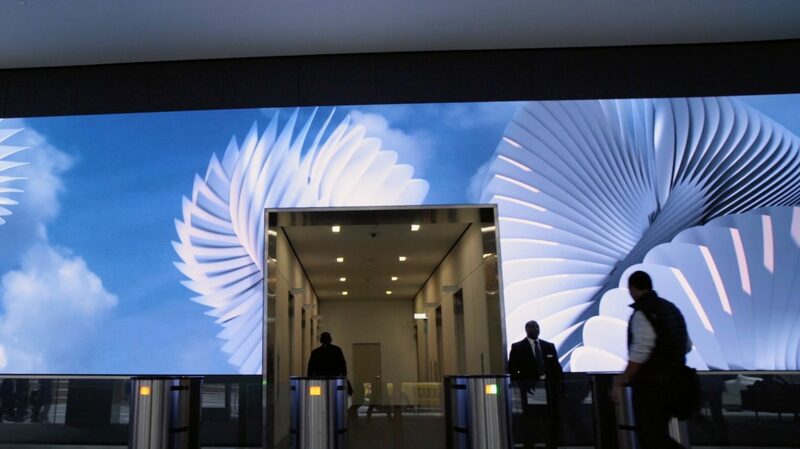 So what makes an office video wall so spectacular? And is this something that can be easily replicated? Simply put, advances in LED panel technology now mean entire walls can made up of LED panels. 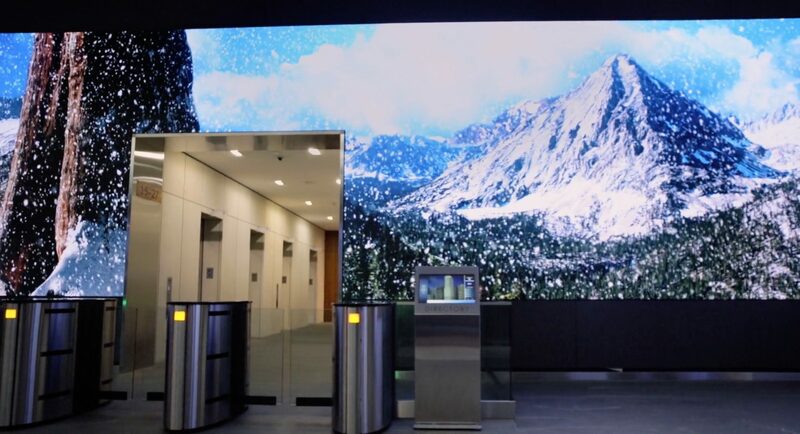 Whereas before a spectacular wall was clad in a beautiful surface, with interesting Art and design features, with perhaps a large plasma TV running BBC News or some such, now an entire wall needs only to be clad in LED panels, and an office video wall can be absolutely anything you want it to be, literally at the touch of a button. Your imagination is the only limit. And if you become tired of your first ideas, it is simple to swap out for a new design and create an inspiring space all over again. 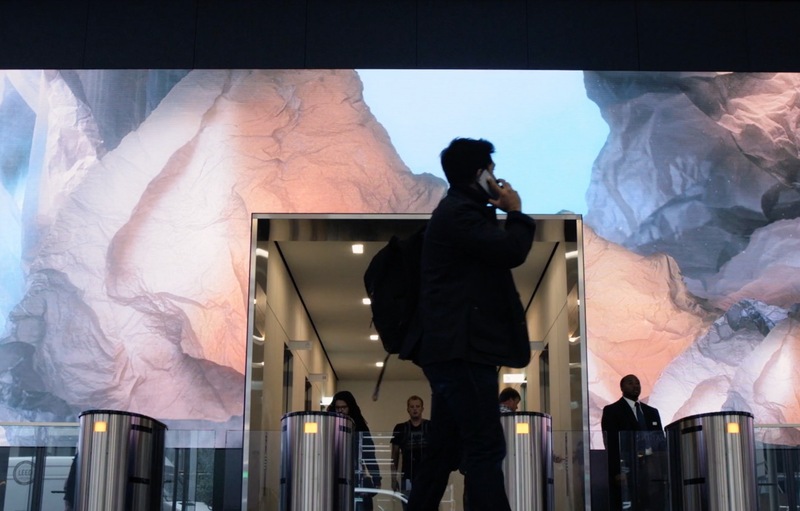 At Salesforce.com head office in San Franscico, Obscura Digital, who specialise in immersive experiences, were asked to create the media for the 107 foot wide installed office video wall and the results are utterly spectacular. The most impressive sequence sees water falling down the wall, splashing onto the top of the entry walls. In other scenes, the office lobby becomes a forest. To make things even more interesting, sprites morph into unusual alien shapes within the landscape to stop people in their tracks. Other scenes turn the wall into a pacman game. In one scene, close views of crumbled paper are morphed into a romantic moonscape. The results, at this size, are nothing short of astonishing. 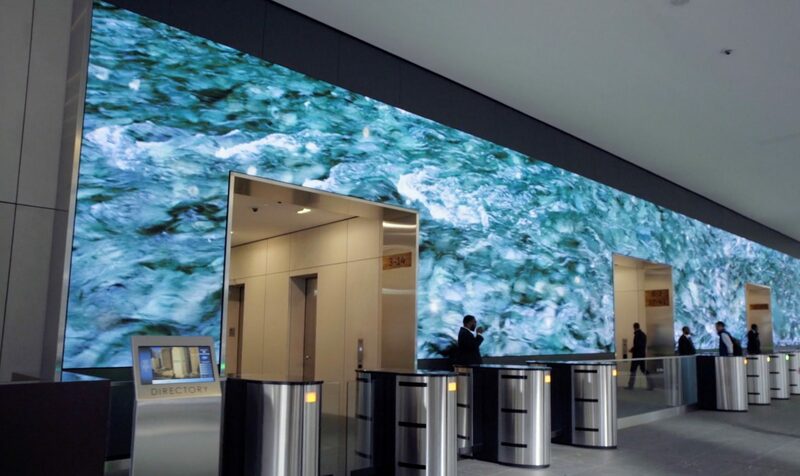 Office video walls aren’t a new idea, but with technology able to reduce the depth and edge of the screen, coupled with falling prices of LED Panels, means the technology is now set to enter the mainstream. 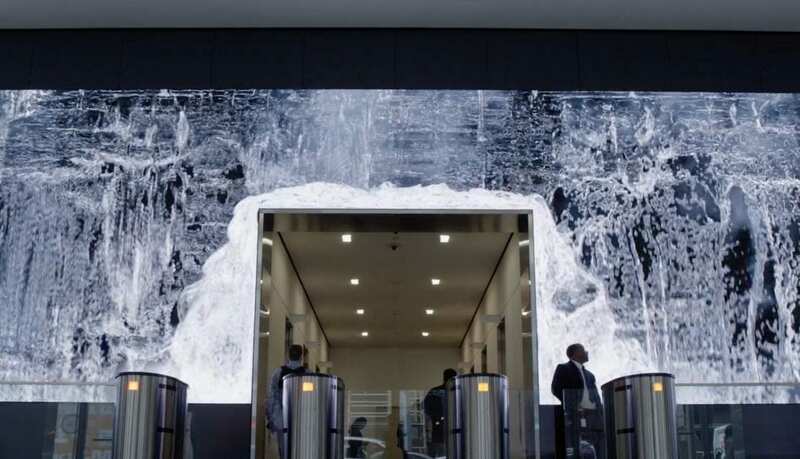 Manufacturers, such as LG, Samsung and NEC now make the hardware – making it easy for someone to replicate the foundations, but what makes it properly spectacular is the creative and design input to make what is shown wow the audience. It will be interesting to see how this technology develops. We’re going to see a lot more office video walls in the future.